Sanitary mixproof valves enable the simultaneous flow of two different products of fluids through the same valve without risk of cross contamination. Unique mixproof valves features two independent plugs, whihc means that a single unique mixproof valve can offer replace two or more valves of other types. Mixproof valves features a top-loaded design, making maitenance fast and easy. It also features no adjustable components, a maitenance-friendly actuator and built-in leakage detection on all seals. Mixproof valves meet most hygienic standards and can be supplied with optional cleaning system. 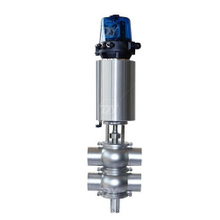 Deyi mixproof valve is a normally closed （NC）valve that is controlled from a remote location by means of compressed air. To seperate the two liquids, the valve has two independent plug seals. The space between the two seals formas an atmospheric leakage chamber. In the rara case of accidental product leakage, the product flows into the leakage chamber and is discharged through the leakage outlet. When the valve is open, leakage chamber is closed. The product can then flow from one line to the other without spillage. The valve can easily be cleaned and priotected against the effects of water hammer according to the specific requirements of the process and the configuration of valves.